E-CYBERTRON Philippines Inc. offers quality call center services, as well as Business Process Outsourcing services set in Lingayen, Pangasinan popularly known as “the heart, the soul and the face” of the province. Lingayen is the home for world-class product. It is also considered one of the most beautiful and most peaceful municipalities that made it worthy to be loved, looked back, visited and revisited. 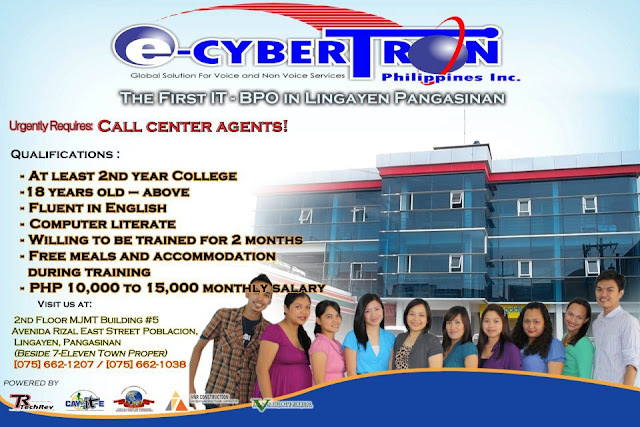 E-Cybertron Philippines is the first BPO industry in Lingayen that was founded in the year 2011 by a group of people who set a vision and followed it through by high levels of determination and hard work. We cater a global business services that account every client complete and full satisfaction. It renders a unique spectrum of social services designed to provide value-driven, creative outsourcing solutions for our customers. Whatever your needs are, E-Cybertron Philippines services can be customized to fit your framework. E-Cybertron is now hiring CALL CENTER AGENTS!